Europa Universalis IV: Cradle of Civilization - Collection PC Digital - CD Keys for Steam, Uplay, Origin and more! 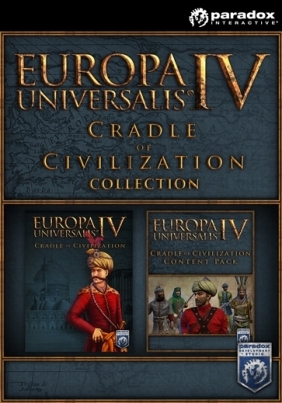 The Cradle of Civilization Collection includes both the Cradle of Civilization expansion for Europa Universalis IV and the associated content pack. Cradle of Civilization introduces a host of new mechanics and opportunities, focusing on the Near and Middle East, as well as central Asia. The Mamluks of Egypt, the Turkoman tribes and Persian states get new governing decisions. Merchants can undertake new missions in their trade nodes, and armies increase their professionalism over time, as well as changes to Islamic governments and religion. The Cradle of Civilization Content Pack includes new unit models for the major powers of the region, including Persia, Gulf States, the Kurds, and Afghans, as well as dozens of male and adviser portraits and a new music pack.